Concerns over the economic realities of gig workers have largely focused on more public-facing firms like Uber, Lyft, Taskrabbit, and Instacart. 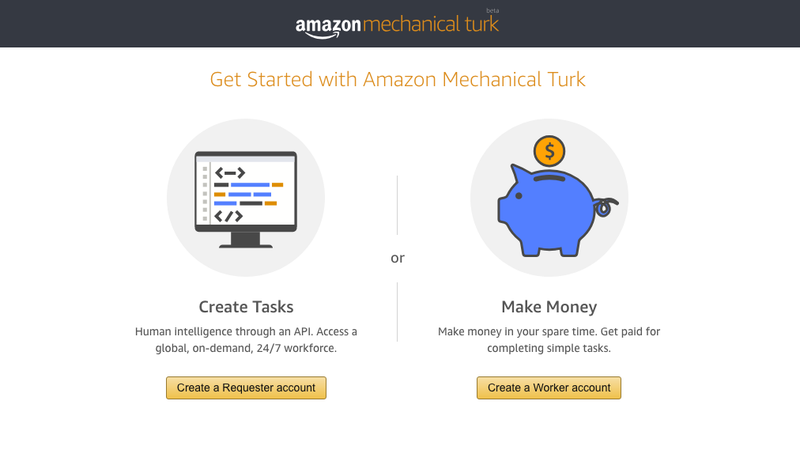 A study released yesterday by the International Labour Organization—an agency of the United Nations—suggests pay and work arrangements are as bad or worse for those working on “microtask” platforms like Amazon’s Mechanical Turk. Microtasks are a variety of menial activities that require human oversight. These tasks are usually performed online and can range from participating in surveys and basic transcription to helping train AI software. On average, the ILO found workers on five major microtask platforms—CrowdFlower, Clickworker, Microworkers, Prolific, and the aforementioned Mechanical Turk—made $4.43 per hour, a dismal figure that dropped to $3.31 when unpaid work-related activities like “searching for tasks [and] researching clients to mitigate fraud” were taken into account. The ILO findings were derived from two surveys of 3,500 people living in 75 countries. The findings were even more grim up when the average hourly earnings of North American workers ($4.70) were compared to those in the Asian Pacific ($2.22) or Africa (a paltry $1.33). While this sort of microtask work is, like other gig economy prospects, often framed as a complement to traditional jobs, the ILO found that around a third of those they surveyed used these platforms as their primary source of income. In many cases, health conditions, or care for young children or sick relatives precluded these workers from seeking other forms of work. Worse yet, the ILO found a direct correlation between reliance on these platforms for income and a loss of social safety in the forms of healthcare, pensions, or worker’s comp. Crowdwork is mired in many of the same issues as other gig economy jobs: workers are considered “independent contractors,” which insulates platforms from the responsibility for basic employee protections like providing minimum wage. Often, the ILO found, the ceding of these rights is buried in long user agreements which are difficult to understand and are often subject to change. Nearly 90 percent of surveyed workers said they experienced incidents where they weren’t paid for the labor they’d performed, and were given little recourse to seek restitution. The design of these platforms, while foisting ratings on workers, does not give the same ability for workers to leave a negative review for a non-paying requester that might dissuade others from being similarly stiffed. Crowdwork is sometimes treated as a “new” kind of work: a transformation of labour predicated by the development of the Internet and the online platforms that currently support it. The argument that these platforms are “new” – something not quite the same as traditional “work” – has been one way that online labour platforms have attempted to evade existing labour regulations.